To modify, to add or to skip option including irrigator, please check it with factory.
" Specification should be revised or updated without prior notice. Please check it with factory, too." Ears are very critical treatment parts for ENT doctor because of doctor’s moving troublesomeness. What is the best solution? It is PRT-5 that is only solution for ENT doctor because he/she want one-stop microscope examination and treatment which is instead of almost surgical operation. • Treatment and examination time is reduced to half. 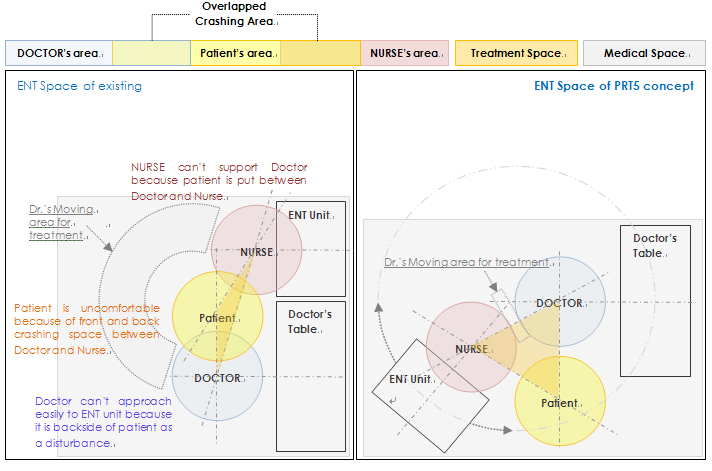 • Convenience of ENT patient is increased more than twice. • Doctor’s working efficiency is increasing to more than twice. • Total ENT performance is expended to more than 5~8 times. • To use microscope 100% perfectly. • To use space 100% perfectly. • Quick treatment and examination without doctor’s standing up. • High quality and silent system with highly performance. • Ergonomics and sturdy designed case with chemical tolerated powder coating. • Vibration sources, like as an electric motor, are departed from main workstation unit. 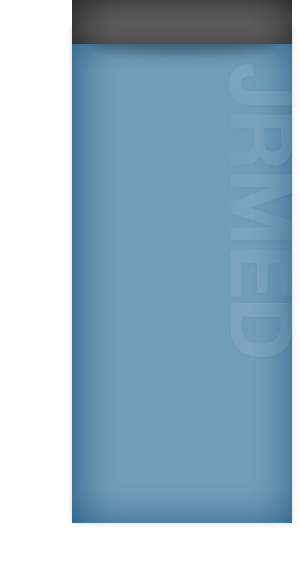 • Stainless airtank with more than 14 L volume. • Compressor and oilless pump capability having up to 250W 2way Head and 100L/min at Max.9kgf/cm2. Operation is 4 to 7.5kgf/cm2 +/-10% with safety valve for 8kgf/cm2. • Injection medicine spray volume with air pressure is more than 5ml/min normal at 1.5kgf/cm2 and Max. 2kgf/cm2. • Vacuum suction pump capability is Max. 740mmHg for main and Max. 650mmHg for subsidiary. Suction volume is more than 200ml for 10 sec with 100L/m at 680mmHg and Suction power is more than 500mmHg for 10 sec. • Optional light intensity of radiation is more than 4.0 x 10000Lux with light angle 45o with light guide cable. LED light is another optional specification. • Medical monitor is fixed basically and additional monitor or X-ray view box is optional. • 4 spray of straight or curved. Optionally it is possible of other composition of sprays. • Joystick ENT chair easy controller; full automatic Up/ Down, rotation, Rising/ Leasing of chair back and leg-support. • Main Switch and Control panel; ON/OFF for Power LED, Microscope, Micro camera, Endoscope, Video selection, Monitor, Light, Warmer, Subsidiary light and Ventilation. 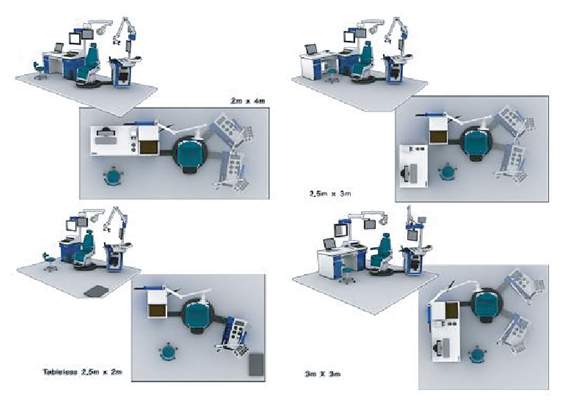 • Foot switches for display capture and ENT chair moving control. • Fuse set for main power and compressor power. • Power Supply door for A/S. • Adjustable internal regulator controller for spray, ventilation and irrigation. • Suction bottle checking window and door. • Turning Switch with 150° rotating. • Ultraviolet Sterilize is 253.7nm±5%. • Multipurpose can with various sizes, Max.15 more and big size 106mm cesspit. • Post pole and fixture. • A/S cover for main PCB easy checking. • Power consent for external display, microscope and aux system. • Protection of over-voltage, over-current and over-temperature. • Sound damper for deflection of air tank and suction / spray motors. 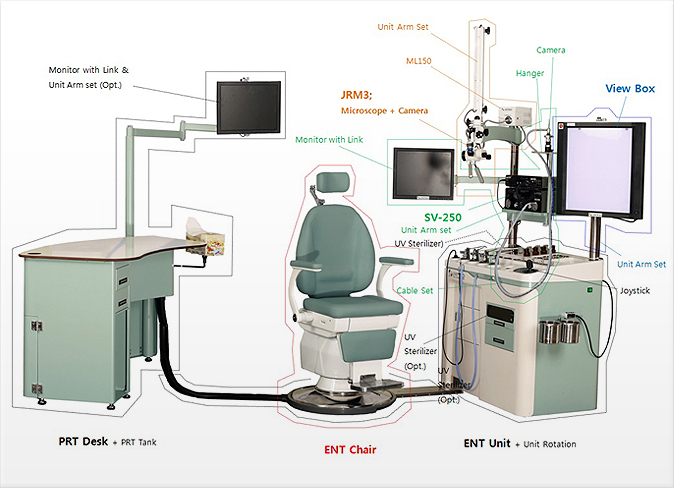 • 360° rotating ENT chair fixture basement with linker, power supply connector, suction and spray air hose connection. • Power Consumption is 1250Watt. • Basement size is 1830(L)x760(W)x120(H)mm with 90kg of weight. 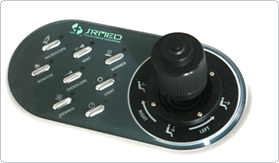 • Rail drawers with UV sterilizing for Instrument, general tools, etc..
• JRMED is a professional producer of concept medical apparatuses for ENT, established with patent by complementing weak points of existing products and developing creative products for doctors' convenient and elegant diagnosis & treatment. 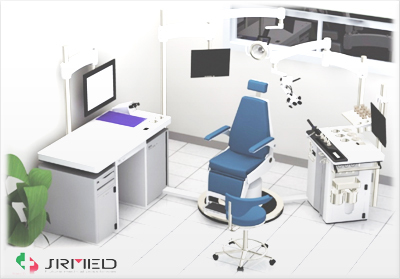 SUPER VISION is a safe product that passed efficiency, safety, EMI tests and obtained permission of KFDA. This apparatus is registered as a product of a patent on a new device. AGC : Raising the level of brightness. AUTO : Control of white balance automatically It looks red in the system. SET : Press WB SET button for 5sec. under the condition that a white object such as a white paper or cotton fills the screen fully on Endoscope or Microscope, and letters of “WB OK” appear on the screen and the object is chosen as the basic color. MANU: apply a cross shaped driver(+)to ‘R’, ‘B’ representing Red and Blue respectively in the lower part and secure the desired color vision. Which one is more effective for space sharing? Which ENT doctor shall do better examination & treatment? Which assistant nurse shall do work for patient and ENT doctor? Which patient must be more comfortable?